High Commissioner Bachelet added that human rights, as enshrined in the UDHR, is an idea that has mobilised peoples and has improved human life through “sustained development” and “conflicts prevented.” But she added that such progress has come under threat as the idea of human rights has come under attack, resulting in the erosion of norms and the undermining of international institutions. She referred to the 2030 Agenda and the Sustainable Development Goals as an opportunity for a greater integration of human rights objectives. She stated that “the Sustainable Development Goals will not progress without discussion of and progress on the so-called “sensitive” issue of human rights. 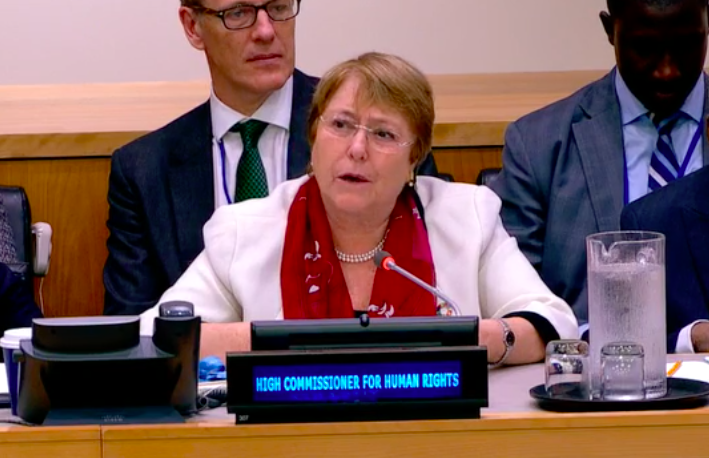 I know this as a former Head of State and Head of Government: development must focus, above all, on the well-being and rights of the people.” High Commissioner Bachelet noted the importance of integrating Treaty Body recommendations and the recommendations of the Universal Periodic Review and Special Procedures mandate holders into useful tools for states and UN country teams to adopt and apply. High Commissioner Bachelet’s emphasis on prevention links with Secretary-General Guterres’s own priorities, both at the secretariat, and in speaking at the 37th Session of the Human Rights Council, where he stressed the importance of human rights implementation for his prevention agenda, and the realisation of SDGs. During the following session of the Human Rights Council, Colombia, Norway, Sierra Leone and Switzerland tabled a resolution on “the Contribution of the Human Rights Council to the prevention of human rights violations.” Resolution A/HRC/38/L.19/Rev.1 was ultimately adopted by vote (as some States raised concerns that such a resolution would be implemented as an “responsibility to protect” initiative). Following the introduction of the resolution, the Council discussed building national human rights resilience to prevent conflict and the use of the Council as an early warning tool to dialogue with State and regional actors at the early stage of violations. While an important step, members of the Council disagreed on how to operationalize the resolution. The Human Rights Council does have a mandate to respond to human rights violations as established by operative paragraph 3 of General Assembly resolution 60/251. This includes a mandate to prevent violations from happening in the first place, and to respond promptly to emerging crises. Starting in 2017, the Universal Rights Group has worked on implementing a project that has the broader objective of promoting the operationalization of the Human Rights Council’s prevention mandate. URG’s Glion Human Rights Dialogue in 2017 also focused on “operationalizing the Council’s prevention mandate,” resulting in a subsequent report. The new High Commissioner’s emphasis on human rights work, including the use of UN human rights mechanisms, as a critical component to sustainable development and peace and security, comes at a time at which human rights, as she points out, can be considered more of a “sensitive issue” than critical tool. Her articulation of human rights as building in resilience to development and security objectives, dovetails with the Secretary-General’s emphasis on prevention. Both the High Commissioner and the Secretary-General highlighting the potential of the Council and its mechanisms to contribute to prevention, adds to the recent Council resolution in creating an opportunity to make prevention strategies at the UN more proactive, more human rights oriented, and making better use of the all available UN tools.